Finally, on a surprise move, the much-awaited Android Oreo Beta for Galaxy S8 (plus) is now rolling in India. It brings Samsung Experience 9.0 to the devices as well. This marks the debut rollout of Android O in the Indian region. The update weighs around 1.3GB in size. Having said that, being in its early phases, you might have to face bugs after upgrading to Android Oreo. Most recently the 4th phase Oreo Beta for Galaxy S8/S8+ started seeding across the US, UK, and Korea. Apart from India, the said test version will also drop into other territories around the globe like Japan, France, Spain, China etc. As per latest information, the beta has gone live in Germany too. Also, this update will seed for those users who have registered in the Beta program. Everyone will not receive it. As the update note below says, beta testers will be chosen on first come first serve basis. The stable version of the OS is expected to drop in by early January 2018. The update is rolling out in India, Germany, Poland, France, China, and many other countries. 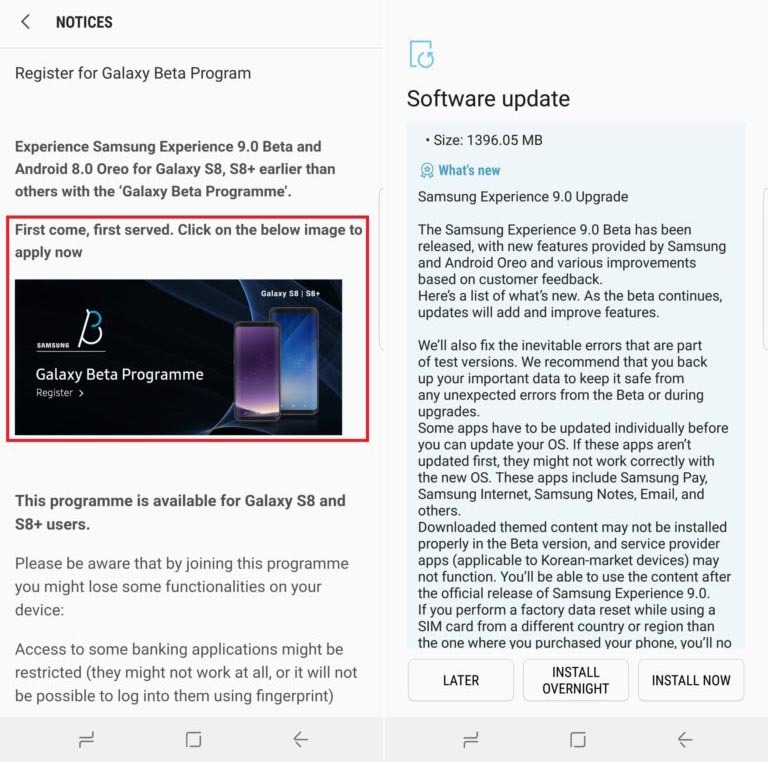 See how to download the Oreo Beta 4 from Samsung Member’s app. The Oreo Beta Now Rolling For Galaxy S8(plus) in the Indian Region. To Download Register For The Beta Program. As we mentioned before you have to apply for the Beta Oreo program. Then you will be receiving the beta update over-the-air. You have to install Samsung Members App. Then apply in the Galaxy Beta Program section by providing your details. Post register if your device gets a slot for the OS upgrade, then you can download the OTA by going to device Settings > System Updates. Tap the Download updates options when it is available. So that’s it. If you are in the Indian region using a Galaxy S8, then get ready to have a bite of Oreo. Register for the Beta program and install Android O on your S8/S8+. Keep scrolling on AndroidSage and follow us on social media handles for all latest updates, downloads about Android O for Samsung Galaxy smartphones.